Presenting evidence or facts doesn’t always get accepted. We can dismiss evidence that contradicts our firmly held beliefs. There is even the backfire effect where we can dig into our belief and hold on tighter than before. A new study shows that challenging political beliefs activates areas of the brain that govern personal identity and emotional responses to threats. 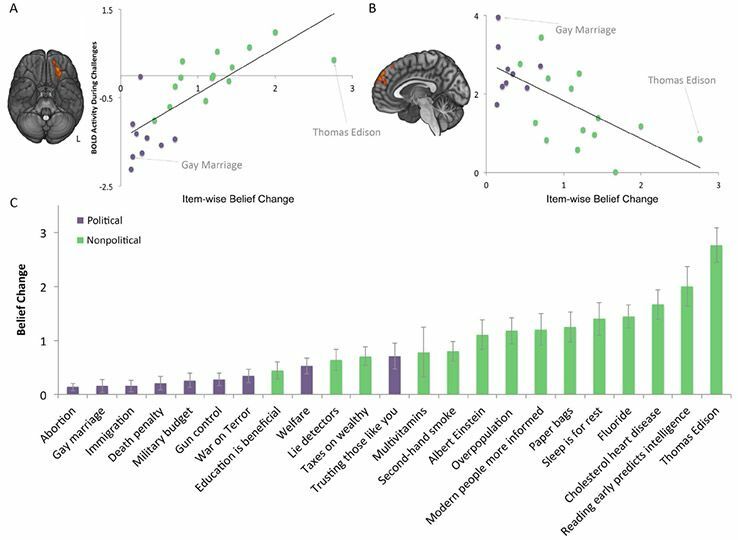 Published in Scientific Reports on December 23rd, Neural correlates of maintaining one’s political beliefs in the face of counter-evidence shows how much we are associating our identity with beliefs. The study set out to look at how much people change their minds on political and nonpolitical issues when provided with counter evidence. This would help them determine which brain networks responded to firmly held beliefs. Contradictory arguments were presented to 40 liberals that held strong political and nonpolitical views. They were all examined through fMRI see how their brains responded to their beliefs being challenged. Nonpolitical beliefs held the most flexibility when they gauged the strength of their beliefs in a statement. For example, “Albert Einstein was the greatest physicist of the 20th century”. But reconsidering political beliefs is another issue entirely. Those who support military, and the funding of the military, would not budge when asked to reduce funding for the military. sourceWhen their political beliefs were challenged, it produced an increase in activity of the default mode network, which are sets of interconnected structures that are associated with self-representation (identity) and disengagement from the external world to focus on ourselves. A narrowing of our mental vision takes place. The amygdala is also involved with perceiving threats and anxiety. The emotional salience of stimuli engages our attention bias and availability heuristic so we focus on it the most and feel threatened, anxious or emotional, which makes us less likely to change our minds. Each participant chose 8 political and 8 nonpolitical statements that they said they believed in, and were shown 5 counterclaims to challenge each statement they accepted. Then the participants rated the strength of the belief in the original statements on a scale of 1 to 7. 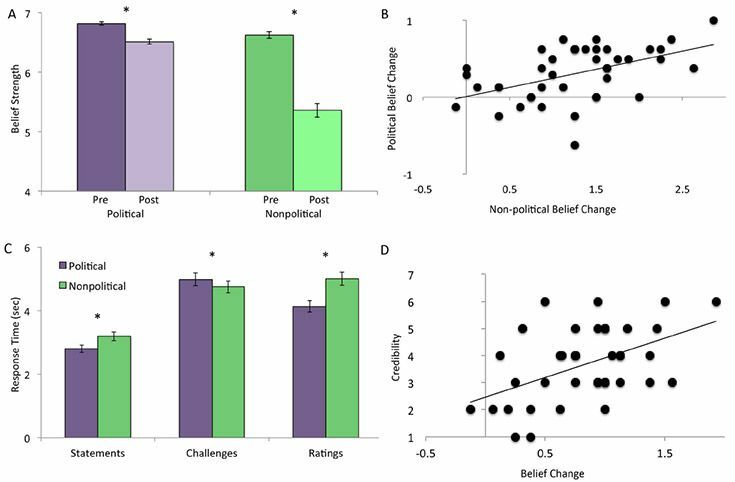 Counterclaims to political beliefs tended to not change minds, while counterclaims to nonpolitical beliefs were more easily influenced to create doubt and reduce the confidence and strength in the statement they previously believed. sourceOne thing to note is that all the participants were strong liberals, so it’s not clear how the results would turn out if it was applied to conservatives or people with less polarized political beliefs. Previous studies have found structural or functional differences between the brains of conservatives and liberals. Despite being a liberal, when someone’s belief is under attack they take that threat personally and proceed to conserve the belief. Conservatives have that tendency for increased threat avoidance. In this way everyone tends to act as a “conservative”. These findings shed light on the resistance to change that emotion plays in our attachment to belief. When our deeply held beliefs are challenged, rather than pay attention to the external world and take in stimulus and process it properly in cognition, we often engage in stimulus-independent internally-directed cognition which creates a feedback-loop that is detached from the objective reality around us. Emotions come into play in the persistence of our beliefs which clouds our ability to see things properly. The brain’s systems for emotions is engaged when protecting our psychological and identity frameworks that are strongly attached to beliefs. The neural systems involved in upholding beliefs and motivated reasoning are also better understood. 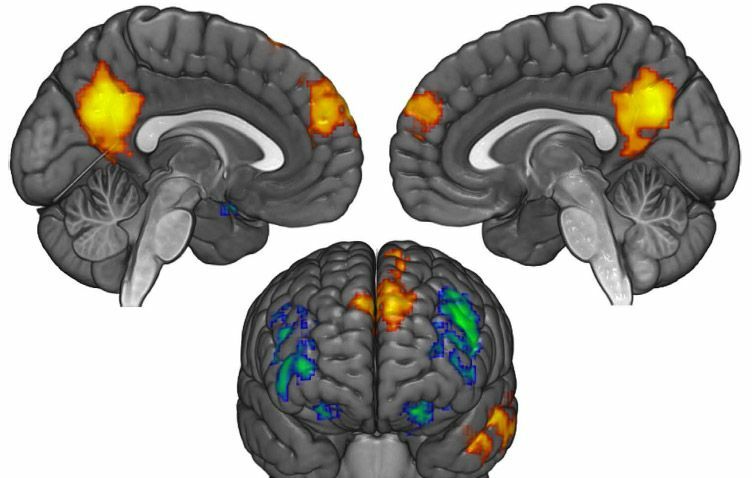 The findings suggest that the Default Mode Network is important for higher-level thinking about the personal beliefs and values we hold dear, whether they are true or false. The new study doesn’t mention the backfire effect but they are essentially explaining this as well. People become more hardheaded and ingrained into their political beliefs when contradictory evidence forces them to take a defensive position. So it’s like you are bunkering up, digging into the trenches for a battle with something attacking your identity through the belief that you’re attached to and don’t want to let go of. I have talked about identity and attachment in many posts before, how our sense of self and worldview can be based on false information and we become attached to that falsity as part of our ego-personality-identity constructs. To attempt to dismantle and destroy a falsity is felt as an attack on a person themselves when they have become attached to that falsity as part of their sense of self and identity. This results in emotionally defensive behavior in order to maintain their false identity. Lead author Jonas Kaplan explains how difficult it is for us to reevaluate new information once we become attached to it as part of ourselves. That’s partially why attachment is the root of all suffering. We get attached to falsity and then truth comes along and we don’t want to accept the truth because we’re too attached to what’s false. This prevents us from moving forward in alignment with truth and reality. These findings are helping researchers understand when and why people are likely to change their minds. One thing that troubles me is they are looking at this in order to determine and know how, and through which statements, someone may be persuaded to change their political beliefs. They view this as a key for societies progress. We are the age of the scientific dictatorship in many ways. These social science models can be used for social engineering and manipulation of consciousness towards political agendas. I always appreciate more discovery in knowledge of ourselves, but it’s a bit alarming when the scientists seem to lack a certain level of integrity. At least that’s how their message comes off to me. As much of my work mentions, emotion is an important part of our internal feedback process to evaluate and apply salience to things in order to motivate us to act. But letting emotion override an honest evaluation process is not beneficial.